During our time at AMBEX students are encouraged to go out into the community and make some new German friends. There is no better way of immersing oneself into a culture than to go out into said culture and really make an effort to function within it. It is in our efforts to adapt into a culture that we can really begin to effect change for Jesus Christ from within the culture. Whether it be leading others to Christ or affirming others in their walk with the Lord, our mission here is real, and very much a blessing to the German people. 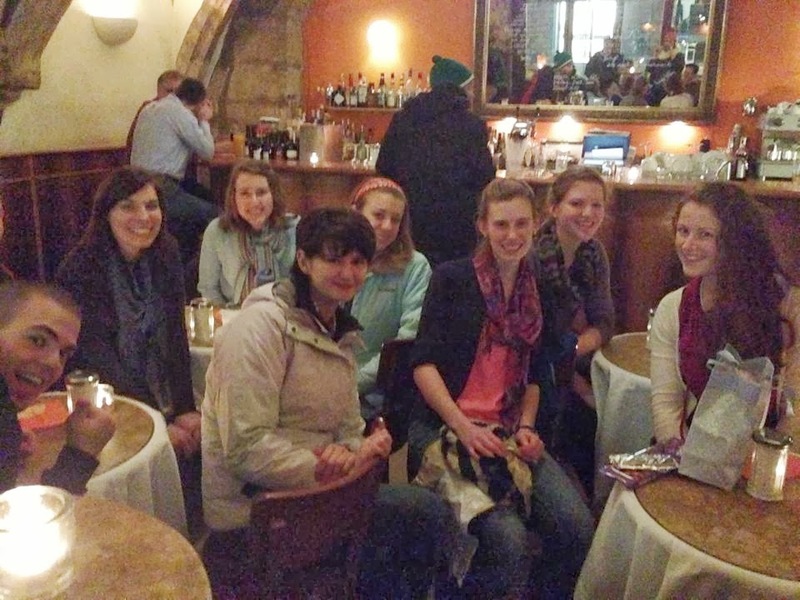 Here, Chrissie Wille, a fellow sister in Christ, enjoys desert drinks with Ambex students in what you might consider a girls night out. Jan Karsten-Kraemer, a local pastor at a free Protestant church in Regensburg, had the opportunity to talk to AMBEX students about the importance of ministry here in the German state of Bavaria. The small but resilient Free Churches stand in contrast to the large German state-supported churches i.e. Roman Catholic and Lutheran/Evangelical. Happy birthday to Hannah Johnson who celebrated her 20th birthday with us here in Germany! On the far right we have our dear German friend Anna, who is not a student here at AMBEX but at the University of Regensburg and a member of the local church we attend. Anna loves the Lord and it is evident. It is always a blast when we have the opportunity to fellowship with her and have her in chapel with us!